Media mogul Rupert Murdoch said Facebook should pay fees to publishers if it is committed to supporting accurate news. His statement comes as pressure mounts on the social network to quell the spread of misinformation. Facebook last week said it would survey its users and prioritise news sources they deemed "trustworthy". Mr Murdoch, who controls titles including The Times and the Sun, said the proposals were "inadequate". He said social media firms should pay publishers a fee in the same way that cable network operators pay for the channels they offer. 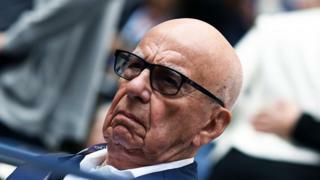 "The publishers are obviously enhancing the value and integrity of Facebook through their news and content, but are not being adequately rewarded for those services," Mr Murdoch said. "Carriage payments would have a minor impact on Facebook's profits, but a major impact on the prospects for publishers and journalists." Neither had he seen a subscription model that "truly recognises the investment in and the social value of professional journalism", added Mr Murdoch, who also controls the Fox News cable channel in the US. Google and Facebook take the lion's share of new advertising revenue - a shift that has hurt the newspapers, which produce most original news. Mr Murdoch is executive chairman of News Corp, which also owns the Wall Street Journal and a stable of newspapers in Australia and elswehere. The company's revenue has declined in recent years and it reported a loss for the 2017 financial year. His comments come as Facebook admitted that social media posed a potential threat to democracy and pledged to tackle the problem head-on. Its civic engagement chief, Samidh Chakrabarti, said in a blog post: "In 2016, we at Facebook were far too slow to recognise how bad actors were abusing our platform. We're working diligently to neutralise these risks now." He also elaborated on the decision to let Facebook's users rank the "trustworthiness" of news sources: "We don't want to be the arbiters of truth, nor do we imagine this is a role the world would want for us." While acknowledging concerns over the rise of "echo chambers", Mr Chakrabarti argued that the "best deterrent will ultimately be a discerning public". Facebook and Google did not offer a response to Mr Murdoch's comments.